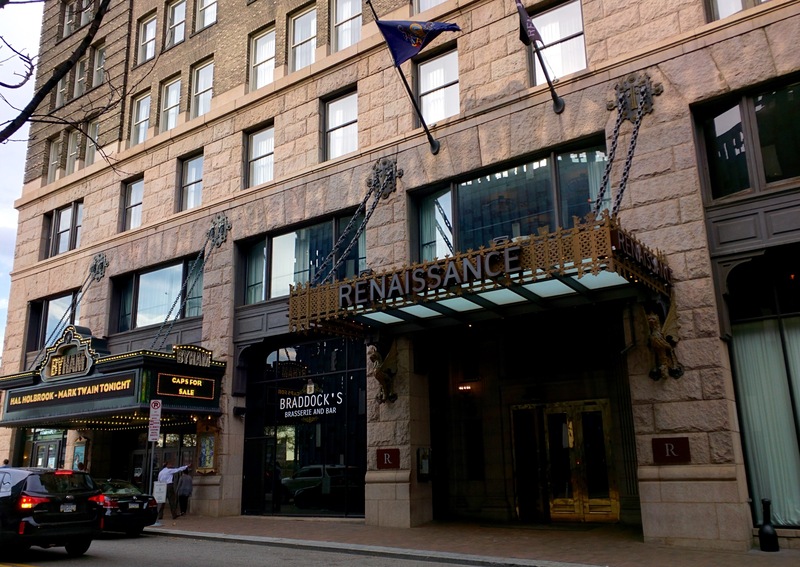 The menu at Braddock’s Pittsburgh Brasserie at the Renaissance Hotel has been updated with new summer dishes. We may be in the twilight weeks of summer already, but at Braddock’s Pittsburgh Brasserie the season’s flavors are still fresh and vibrant. The restaurant in the Renaissance Pittsburgh Hotel, owned by Sage Hospitality Group, has updated its menu with new French-inspired summer dishes. 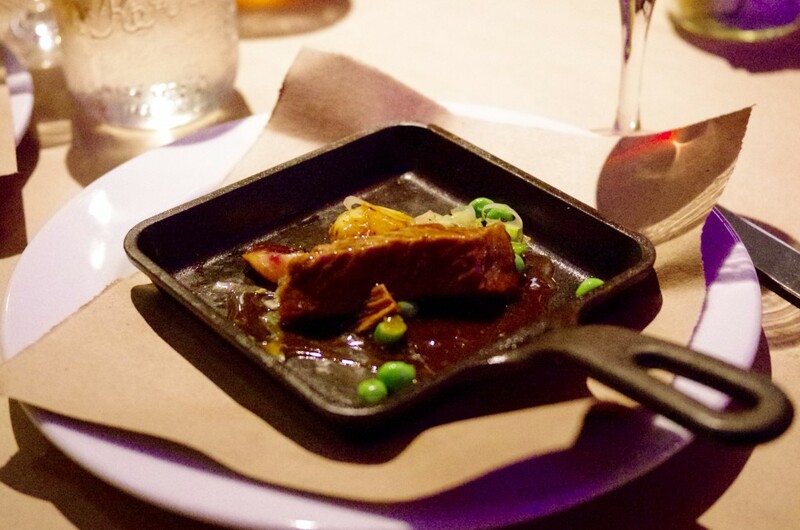 Executive Chef Jason Shaffer introduced the refreshed menu at a tasting dinner, where eight of the new seasonal dishes were presented. Shaffer’s career began in the local area—as a line cook at an Italian restaurant outside of Pittsburgh, at the age of just 13. He’s had success in restaurants in Las Vegas and New Orleans before returning to Pittsburgh following Hurricane Katrina, and was previously Executive Chef at Morton’s The Steakhouse. At Braddock’s, Shaffer aims to showcase the best of local produce and the melting pot of cultures in Pittsburgh, and the menu has drawn from as close to home as his grandmother’s peach cobbler recipe, to delicacies from further afield. 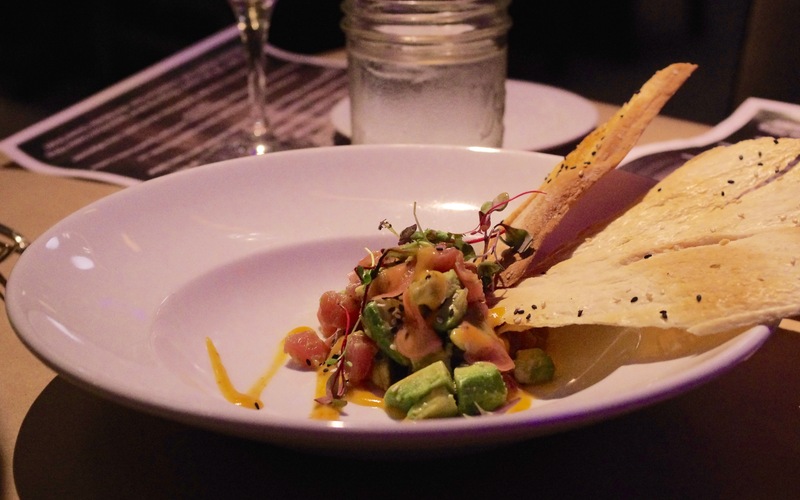 Tuna Tartare with avocado, preserved radish and harissa orange mignonette, served with crunchy, peppery crackers. Tuna Tartare followed, with cubed avocado, finely sliced preserved radish, tangy harissa orange mignonette, and large shards of crunchy, peppery cracker. The tuna was fresh and flavorful and, like the oysters, allowed to shine without a great deal of fuss. The Duck A L’Orange continued the citrus theme, with a bourbon orange glaze coating the tender, just-pink duck, which was served with smoky roasted cauliflower and fava beans. A seafood-packed Bouillabaisse Rouille, with walleye, mussels, shrimp, and vegetables, and a chewy garlic bread. 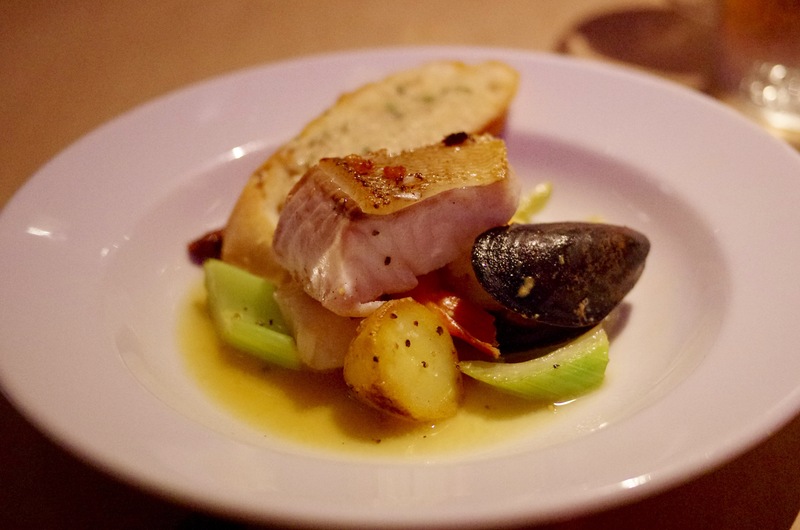 The excitement for seafood-lovers continued with the Bouillabaisse Rouille—a flavorful and subtly-spiced broth, with walleye, mussels, shrimp, and a selection of still-crunchy vegetables. 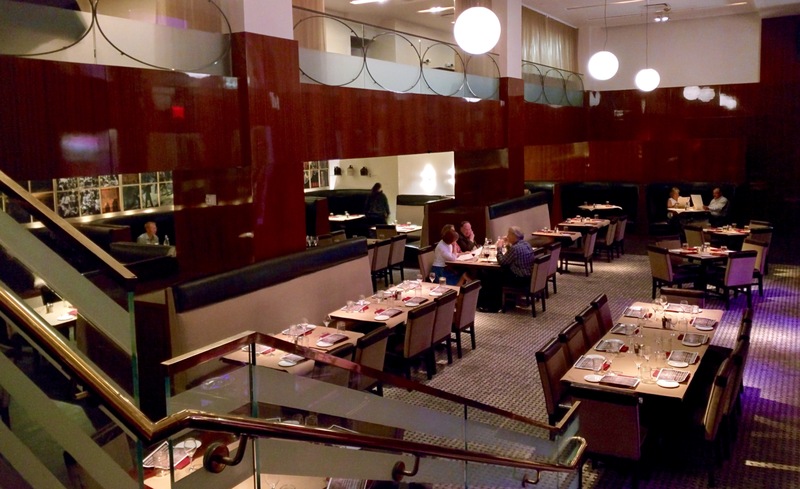 The dining room at Braddock’s offers a warm, elegant ambiance. The large two-level dining room at Braddock’s was quiet during our mid-week tasting menu, with a couple of large groups keeping the kitchen busy, but the room is well-partitioned, and has an elegant, classic design. The six-hour brisket, with potato and spring vegetables, is packed with flavor. Shaffer described the Pot-Au-Feu with six-hour brisket and vegetable fricassee as an “old school, one-pot dish”, but it’s probably not like any one-pot beef stew you’ve ever cooked. And “one-pot” might be understating things a bit, as all the vegetables were also separately grilled, roasted or charred to the perfect finish. The brisket was cooked until not-quite falling apart and deliciously rich. Grilled Chicken Basil Pesto Risotto followed, topped with a coddled egg, ready to break and stir into the rice for extra creaminess. The risotto had a fresh, lemony kick, and was topped with fine parmesan “snow.” It packed such a flavor punch the basil pesto chicken breast on top was almost unnecessary. 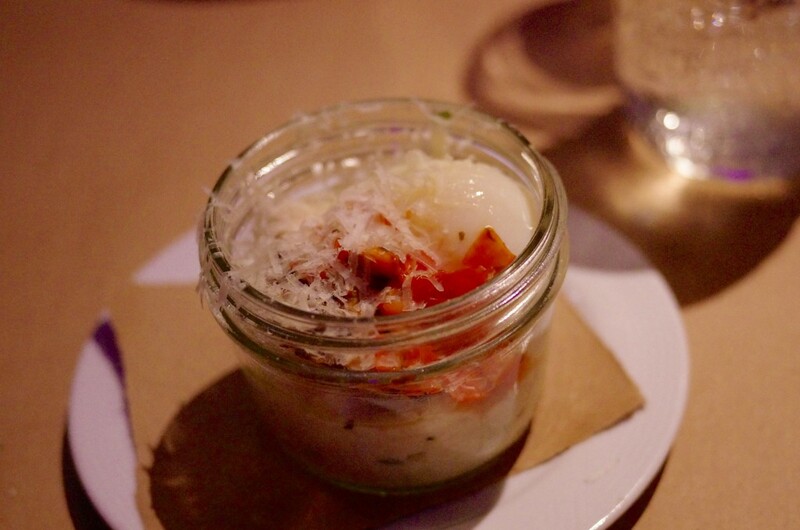 Our tasting portion was served in a mason jar, which looked charming, but no one at our table could find a polite way to cut the chicken breast without plopping it out onto a side plate first. A lemony risotto was served with grilled chicken breast and topped with parmesan. A simple Arugula Salad with faro, bacon, candied onion, sticks of crisp apple, and a citrus mignonette, helped to ready us for dessert. 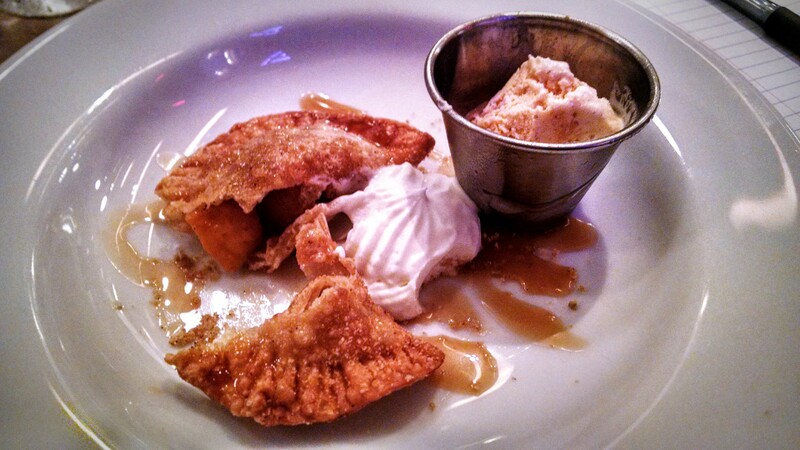 The Peach Cobbler ‘PIE’rogi had been calling to me from the menu all night, and it didn’t disappoint. As Shaffer explained, the cobbler was his grandmother’s recipe, although his grandmother didn’t serve it inside a pierogi shell. The crisp pastry and sweet peach filling was served with cinnamon ice cream, mascarpone whipped cream, and warm bourbon caramel drizzle. A peach cobbler ‘PIE’rogi, served with cinnamon ice cream, features executive chef Jason Shaffer’s grandmother’s cobbler recipe. Our meal didn’t finish with a whiskey, but if that’s your tipple, Braddock’s is the right place for it. The restaurant pays tribute to the Whiskey Rebellion of 1794, when area farmers and militiamen attacked the home of local tax inspector, General John Neville, in protest over a new whiskey tax. President George Washington responded by riding to Western Pennsylvania with 13,000 troops to stamp down the protests. Braddock’s signature whiskey cocktails include the Braddock’s Smash, Red Coat, and Appomattox Olde Fashioned. It also offers an extensive list of domestic and imported whiskeys. Braddock’s will be showcasing the new summer menu at a Chef’s Table dinner on Thursday, August 13, with a prix fixe four-course menu, plus optional wine matching. Breakfast: 7 a.m. – 11 p.m. Lunch: 11 a.m. – 2 p.m. daily. Dinner: Sunday to Thursday, 5 – 9 p.m.; Friday and Saturday, 5 – 10 p.m..
Heather McCracken is a Pittsburgh-based freelance writer.